Iraq war veteran and Army National Guardsman William Everett Alemar was getting in some training in Martinsville, West Virginia on August 20 around 7am, when phone calls began to pour into the police station that a man was running down the road near a school a protective vest and fatigues with what appeared to be an assault rifle on his back. Three police officers were on the scene in a matter of minutes with weapons drawn and forced Alemar to the ground. It turns out Alemar was doing nothing more than an air-soft "training" rifle. That's right it was a bb gun that shoots soft rubber pellets and is distinguishable from a real weapons that shoots real guns by the bright red tip on the end of the rifle. In effect, it was a toy gun and police should have known that the instant they took possession it. 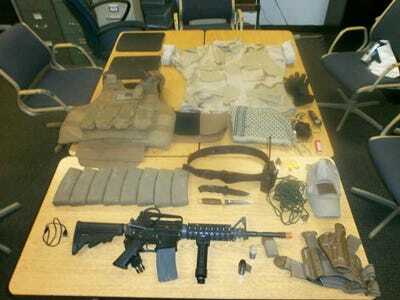 As you can see Alemar did have other things on him, including knives and ceramic plates in his vest. Again all of this was for simply training. Alemar has been arrested under charges of "committing a terroristic act and wearing body armor while committing a felony offense," according to official records. He's being held on a $50,000 bail. Police say that his behavior caused local people fear of immediate threat. But Alemar's father told reporters, "my son is not a terrorist, he's a good kid," and added that he was just trying to stay in shape for his next assignment. Alemar was assigned to a special operations unit in Iraq, so I guess it's plausible that he was "just training." While the police quickly realized the gun was a toy, it was their finding of a knives and the body armor that disturbed them. However, they should have known their was no criminal intent in the matter at all because had the Alemar intended to be a terrorist, he wouldn't be running with a bb gun! This is common sense people, not rocket science. Personally this is just over the top. I can remember as a kid running around with bb guns, both pistols and rifles and the cops would see us doing that all the time. It was never a big deal. But seriously, to charge a veteran with "committing a terroristic act and wearing body armor while committing a felony" is a bit too much, don't you think? What felony was committed? Being armed with a bb gun? That's a felony? Wearing body armor ups the charges on carrying a bb gun? The police involved in this matter should have their pants sued off. They should be informed enough to know what a toy gun is versus a real one when they get the guy on the ground and take it from him. Now on behalf of police, I can definitely see the concern on their side. However, once it was found out what the "weapon" was, they should have simply let the man go on his way. Nothing illegal was taking place and most definitely there was no terrorist activity going on. Hopefully John Whitehead and the Rutherford Institute will also go to bat for Alemar the way they did for Brandon Raub. Sadly, we are becoming a nation that is paranoid and with paranoia comes the rise of the police state.